If you're looking for a Bio Bidet remote controlled electric bidet seat but don't want to spend more than $400 you're left with 2 options: the Bio Bidet BB-400 and the USPA-4800 (aka UB-4800). So let's have a closer look into both models. Time to Replace Your Old & Inefficient Toilet? Read This Now! Narrow Down Your Choice in 30 secs! As of this writing the bidet toilet seat line from Bio Bidet counts 13 (!) models. Narrow down your choice very quickly and make your research easier by answering some simple questions. Both bidets require an outlet nearby the toilet. 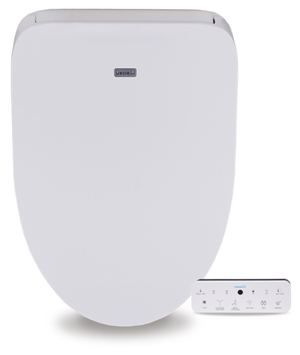 If you don’t have electricity nearby and don’t plan to add a new outlet or you just want a seat with basic bidet functions look into Bio Bidet’s non-electric seat models. Both bidets only require a cold water connection. Neither allows for direct connection to your hot water system. Warm water is provided by an onboard water heater. Warm water is provided by an onboard water tank. Water temperature is adjustable. Both models feature nozzles for posterior and feminine wash.
Oscillating wash option allows for a wider cleaning area. Nozzle position is adjustable allowing you to adjust the nozzle to your body shape. Both models feature self-cleaning nozzles before and after each use. The water spray pressure can be adjusted on both models. Both models feature a heated seat. The seat temperature is adjustable. Both models feature a soft-closing seat to prevent loud slamming of seat and lid. Both models come with a wireless remote control to control the bidet. Both models come with a power save mode allowing the bidet to consume less energy. 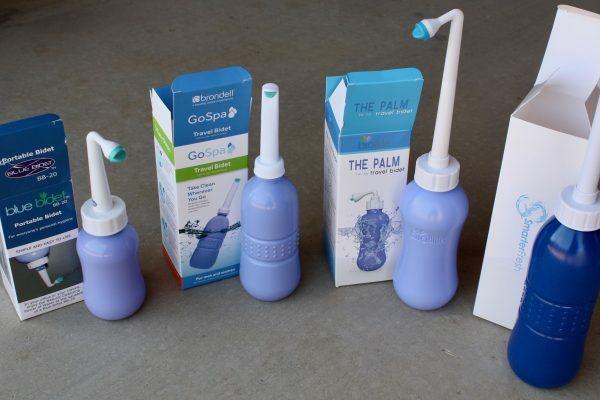 3-in-1 nozzle system with separate spray for male back, female back, and female front. 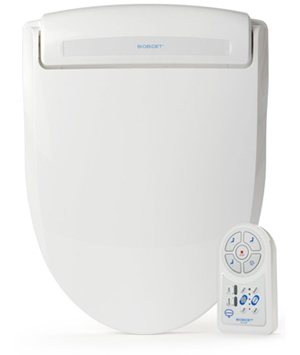 Warm air dryer with adjustable dryer temperature to reduce toilet paper usage. Dual nozzle system with male & female users sharing same posterior nozzle. Pulsating wash option makes the water stream pulsate for a massaging experience. Kids wash option adjusts wash functions to be suitable for children. Good function and easy installation are sometimes hard things to balance. In this case, you are not faced with any uncomfortable dilemma. Both bidet seats are pretty straightforward to install; both are electrically powered, so they’re going to be about the same difficulty, which is very low. Both house an onboard tank and neither allows for direct connection to your hot water system. No winner here. One feature might help tip the scales for you; the BB-400 has a warm air dryer – which is a big plus and saves on toilet paper. That’s more soothing and potentially more hygienic. Both have fine spray wands, but the BB-400 has three nozzles in one wand; the USPA-4800 is a dual-nozzle model. Usually, more is better, but two is plenty for me. Nothing to tip the scales here. One minor feature on the USPA-4800 is a definite nice to have: silent mode. The USPA-4800 beeps when you make a selection. That beeping sound can be turned off, which I really would make use of, especially in the middle of the night. That said, the hand-held remote for the USPA-4800 is hands down a winner for me. It’s easier for me to hold and use than the one for the BB-400. It also houses controls I find much easier to understand. Admittedly, that’s a personal thing. Your mileage may vary. They both do the job. And the BB-400’s isn’t obscure, just not my taste. If you have children you might favor for the USPA-4800 for its “kids wash” feature, which adjusts for smaller users. I don’t have any but its presence certainly is no downside. It doesn’t up the price at all, and one does get visitors from time to time. One thing that does make a difference for me is the pulsating wash – included on the USPA-4800 but lacking from the BB-400. How much weight you put on this feature is a strictly personal choice, naturally. For my money, it’s a medium value. The pulsing water soothes. It increases hygiene for the same amount of water pressure. And I suspect it even helps keep the nozzle clean a little better. On the other hand, both models have an oscillating wash, so that helps balance things out a bit. Also, they both feature self-cleaning nozzles, so there’s that. Now we get to an area that is a little more nebulous: style. One aspect of style isn’t really a matter of personal taste in bidet seats. The USPA-4800 is strictly an elongated model; the BB-400 comes in elongated or round style. So if that’s a requirement, your choice here is made for you. Keep in mind, though, that Bio Bidet has LOTS of bidet models to choose from, not just these two. Click here if you want to do a new search. With that prelude, I personally like the USPA-4800’s looks better. That curved profile is different and appeals to my sense of the unique. And if your space near the wall is constrained, say by a countertop, the curved seat might help it stay up. So, which to choose: BB-400 and its warm air dryer and so-so remote control, or the USPA-4800 and its stylish appearance, pulsating wash, and preferred remote control? I’m going to go with the USPA-4800. Beyond the desire to have a fashionable bathroom, I just know I’m going to like the functions better, in the long run. Want to Find Out Which Bio Bidet Seat is Right For You? Take This 30 Second Questionnaire!